Netilat Yadayim Towel, TME - 3 CAT# TME - 3 .Ritual washing, or ablution, takes two main forms in Judaism: tevilah, full body immersion in a mikvah, and netilat yadayim, washing the hands with a cup. The first written records for these practices are found in the Hebrew Bible, and are elaborated in the Mishnah and Talmud. They have been codified in various codes of Jewish law and tradition, such as Maimonides's Mishneh Torah (12th century) and Joseph Karo's Shulchan Aruch (16th century.) These customs are most commonly observed within Orthodox Judaism. In Conservative Judaism, the practices are normative with certain leniencies and exceptions. 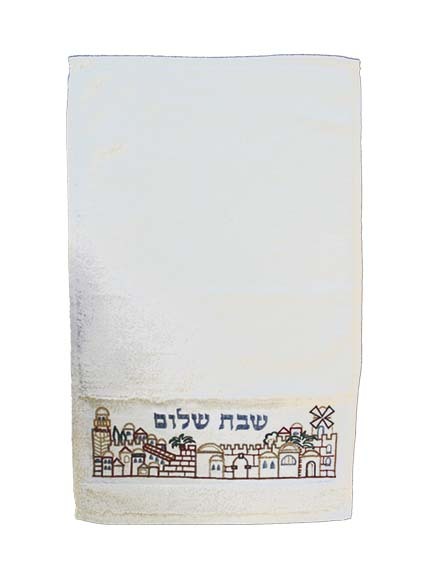 Ritual washing is not generally performed in Reform Judaism.